If the Moon were the size of a tennis ball then the Earth would be the size of a basketball. How far apart should the balls be placed so that the distance is to scale? Before you read on, you might like to have a go yourself. If you don't have a tennis ball and basketball to hand, you can play with this online version I wrote. The Moon is (on average) 384,400 km from the Earth (the Lunar distance, measured from the centres of the two bodies), which is 111 times the Moon's diameter. Scaling this to the tennis ball, we get a distance of 111 × 6.5 cm = 7.2 metres. 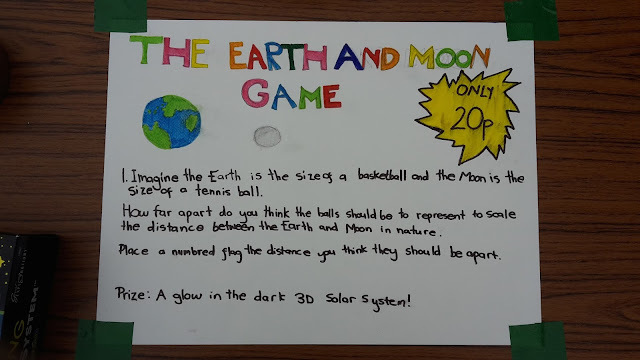 The basketball representing the Earth is in the bottom of the picture, and the tennis ball just visible at the top is the Moon, 7.2 metres away. 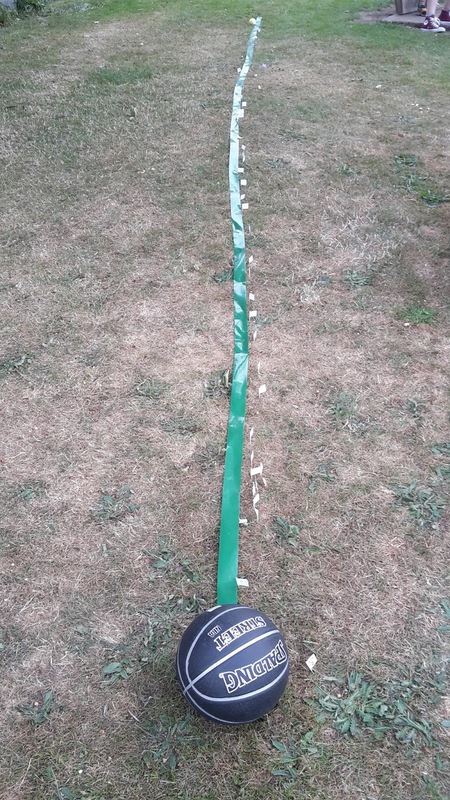 To the right of the green tape are white flags that are the players' guesses for where the Moon would be. We saw a few interesting tactics though. One girl put one flag so it was the closest to the Earth compared to all the other flags, then another so it was the furthest out. She seemed to think that everyone else had either over- or underestimated the distance - which of course they had! (She didn't win though, as someone put their flag even further out later on.) Someone else put five flags over a range of about 25cm where she thought the Moon would be. The most successful approach seemed to be for the player to stand where the Earth is, and have someone walk away holding the tennis ball until it subtends the same angle as the Moon does in the sky (or your mind's eye). This is easier said than done, however. The player in fourth place (who was about five years old) used this technique. Here's the data plotted graphically, with each flag shown as a line. The blue line represents Earth, and the orange line the Moon. For the Earth Moon Game, however, the median distance was 2.6 metres, and the mean was 2.7 metres, which was 2.3 standard deviations (sd=1.96 metres) from the true distance, 7.2 metres.